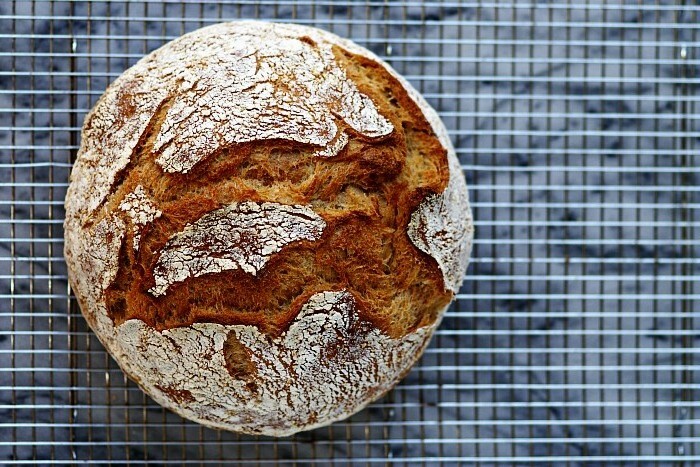 Making this bread recipe, adapted from cookbook author and cooking teacher Penni Wisner, is one of the most satisfying things you’ll do all week. From mixing the ingredients to flipping the finished loaf out of the pan, the whole process is satisfying. And with this no-knead technique, time and the yeast do most of the work for you. I like dusting the dough with cornmeal for a nice crunch, though you can use sesame seeds, poppy seeds, rolled oats or simply flour. I highly recommend using a kitchen scale to weigh the flour — it’s easier, really, and you’ll get more consistent results. Use this recipe as a base, mixing in anything you like, from chopped rosemary and olives to chunks of dark chocolate. Put a 3- to 4-quart bowl on a kitchen scale. Weigh out the flours and salt. Add the yeast. Stir with a whisk to combine. Add the warm water, and stir with a wooden spoon until it gets too heavy, and then switch to a rounded bowl scraper. Once everything is incorporated, you’ll have ragged-looking dough. Cover the bowl with a dinner plate. Let stand 30 minutes, then uncover the bowl and use the bowl scraper to scrape the sides of the bowl and fold the dough over itself. Cover. Repeat this 2 times. Each time, you’ll notice the dough gets smoother. Let the dough stand, covered, at room temperature for 18-24 hours, or until the dough is very bubbly and just about at about the top of the bowl. Dust a counter or pastry board generously with bread flour. Use the bowl scraper to scrape the dough onto the counter. Dust the top with more flour. Fold the dough over onto itself—pick up one side and fold it to the middle, then the opposite side, then the top, and then the bottom. Press down lightly, adding more flour as needed, and repeat the folding one more time. Flip the dough over and shape it very gently, cupping it between your palms and rotating it, into a ball. Cover with the bowl, and let it rest 15 minutes. Gently reshape the rested dough into a ball and place it, seam-side-down, on the tea towel. Dust it lightly with bread flour and then with cornmeal. Cover with another tea towel and place the board and dough in a large plastic bag (a kitchen garbage bag works well) to proof. Let stand 1 hour. While the dough proofs, place a 4- or 5-quart covered cast-iron Dutch oven in the oven. Preheat the oven to 500°F. Remove the dough from the plastic bag; set it somewhere where it will be easy to transfer the dough into the preheated Dutch oven. Remove the Dutch oven from the oven and remove the lid. Remove the top tea towel and carefully flip the dough into the pot. The dough will now be seam-side up. (This is important—the loaf will open along the seam as it rises. If the dough drops seam-side-down into the pot, just use a sharp knife to cut a slit in the top of the dough so it can rise properly.) Grasp the pot with your hot pads and give it a good shake to make sure the bread rolls easily in the pot and is not sticking. Cover the pot and return it to the oven. Immediately lower the heat to 425°F. Bake 30 minutes. Remove lid from Dutch oven and bake an additional 30 minutes or until the bread is dark gold on top. Immediately turn the loaf out onto a rack to cool.